The preceding statements used a small number of discrete colors to show the range of values. In contrast, the following statements use a color gradient. The SAS autocall macro Paint is available for generating the CELLSTYLE colors list with a list of interpolated colors. If your site has installed the autocall libraries supplied by the SAS System and uses the standard configuration of software supplied by the SAS System, you need to ensure that the SAS System option MAUTOSOURCE is in effect before you begin using autocall macros. The macros do not have to be included (for example, with a %INCLUDE statement). They can be called directly once they are properly installed. For more information about autocall libraries, see SAS Macro Language: Reference. A value of 0 maps to white, a value of 2.5 maps to cyan, values in the range 0 to 2.5 map to colors in the range from white to cyan, and so on. The Paint macro for this step creates an output data set, Colors, which is shown in Output 20.10.2. This shows the color interpolation for a series of points. You could use a smaller BY value in the Paint macro to get more points along the color gradient. However, a few dozen colors are usually sufficient for most purposes. Values in the range –0.99 to 0.99 follow the interpolation red to magenta to blue to cyan to white to cyan to blue to magenta to red. Of course, the actual correlations for these data do not span this entire range, so a pure red background does not appear in the matrix. Correlations of 1 and –1 are displayed as light gray. 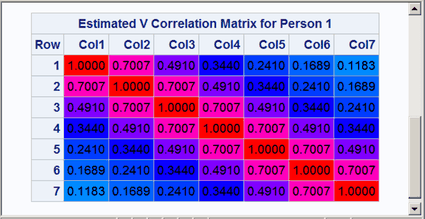 The resulting correlation matrix is displayed in Output 20.10.3. Notice that there are now a number of shades of colors, particularly shades of blues, not just a few discrete colors. The largest values are displayed in shades of purple and magenta. The results are displayed in Output 20.10.4 and Output 20.10.5. Both the covariance and correlation matrices have a structure that is more obvious when colors are added to the display. In particular, the colors clearly show the banded structure of the correlation matrix. The Paint macro creates the SAS data set Colors with the result of the interpolation. This data set can be processed to create a format. The DATA step creates a range of values from Start to End and assigns a color to Label based on the color computed by the Paint macro. This data set is input to PROC FORMAT to create the format PAINTFMT. PROC TEMPLATE uses this format to set the color of the values in the table. 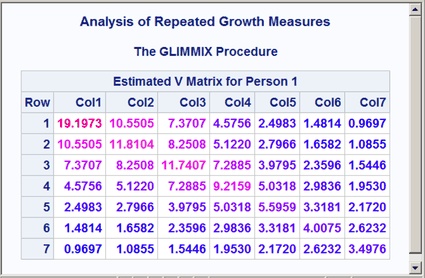 The cell value is evaluated using the specified FOREGROUND= format for every cell in the table, and the appropriate color is assigned. 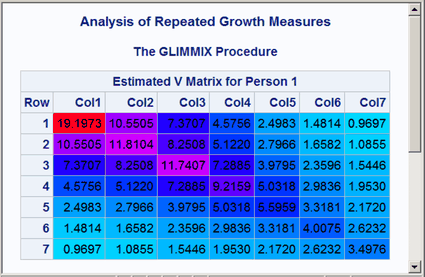 PROC GLIMMIX does the analysis, and the results are displayed in Output 20.10.6. Many other effects could be achieved by using this approach and different options in the STYLE= specification.